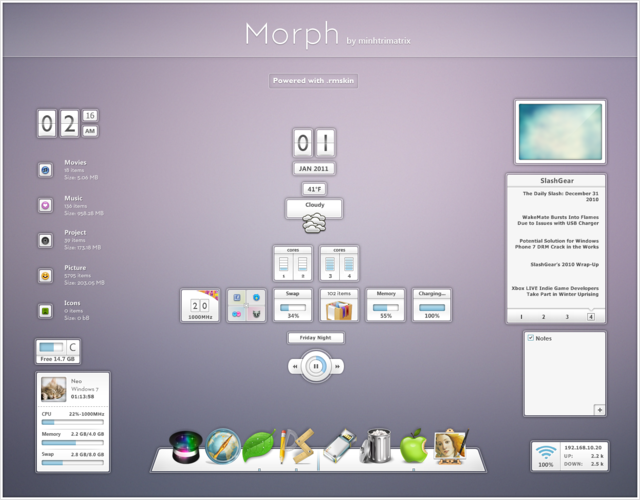 Morph Rainmeter Skin by Minhtrimatrix. Hello everyone, today I want to share on of rainmeter skins. Name of this skin is Morph created by Minhtrimatrix. I find this skin from DeviantArt on Minhtrimatrix gallery. So, before I share this skin, I want to say thank's alot for Minhtrimatrix for your awesome skins. If you first time using rainmeter skins, strongly recomemended for you to read tutorial install raimeter skins. Don't forget to support the author with visit, like and watch Minhtrimatrix gallery. See you to the next article.